Lately it has become all too easy to dissociate from politics. The news is saturated with doom and gloom reports about the environment and the way that the current administration is systematically dismantling any protections we rely on to protect it and our health. Many people, especially young people, find it easier to be apathetic than to face reality and get engaged. However, this job has made it so much easier to be optimistic for about the future. My take-away from the past few months spent pounding the pavement is that people are ready to see a real change in direction when it comes to the way we are confronting sustainability and environmental justice and people are willing to take action to make their voices heard to force that change. During a recent visit to Clean Water’s Boston office, I attended a community forum about Representative Jennifer Benson’s proposed carbon rebate plan. Representative Benson’s bill would introduce a fee on carbon emissions, encouraging individuals and businesses to cut down on their use of fossil fuels and move towards cleaner energy sources. Many other countries have adopted carbon pricing, and the results have been overwhelmingly positive. Nineteen other states are currently modeling similar bills after Representative Benson’s. Obviously, this bill would have significant climate change benefits, but what stood out to me was the bill’s focus on low income communities and communities of color. Recognizing that these communities are affected most by climate change, yet are often excluded from the efforts to combat it, Rep. Benson developed a plan to make the shift to a sustainable society which is accessible and non-detrimental to low income individuals and communities. Shifting to the use of new, clean energy sources may raise energy costs, but the rebates stipulated in this bill for low and middle income individuals as well as people living in rural communities ensures an equitable transition. Dr. Jonathan Buonocore from the Harvard School of Public Heath spoke on the public health impacts of climate change and why concern for our health and safety should affect the way activists approach the issue. Dr. Buonocore opened his presentation with the statement, “I have met a lot of climate deniers, but I have never met anyone who doesn’t believe in heart attacks, and I have never met anyone who wants to get one”. As a canvasser, I have found that it can be pretty difficult to convince someone who is more politically right leaning of the importance of sustainability, but this was an important reminder that protecting the environment is not a partisan issue, but a matter of public health. Clean Water Action’s New England Director, Cindy Luppi also spoke on the ways in which we need to be advocating for carbon pricing, emphasizing the importance of grassroots strength and collective action. 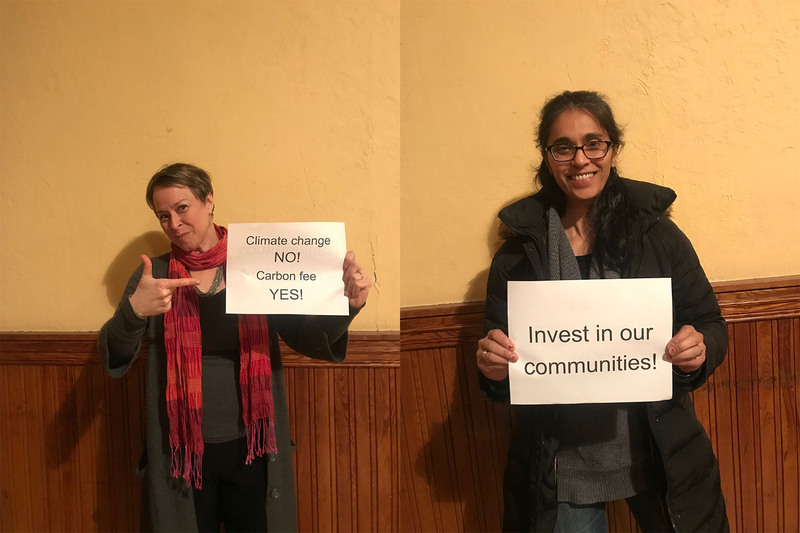 As part of the event we invited community members and activists in the room to have their photos taken holding signs reading “Climate change, NO! Carbon fee YES!” and “Invest in our communities!” The eagerness to participate and abundance of positive energy and passion from the activists and community members at the forum was truly inspiring and I am very excited to be a part of the work that is being done and can’t wait to see this bill progress!